New Delhi & Melbourne, 5 September: It was a rainy evening when the Narendra Modi Government’s first guest, Australian Prime Minister, Mr. Tony Abbott, on a state visit to India entered the Hyderabad House in New Delhi. The Australian Prime Minister was in his formal suit but his body language was friendly. 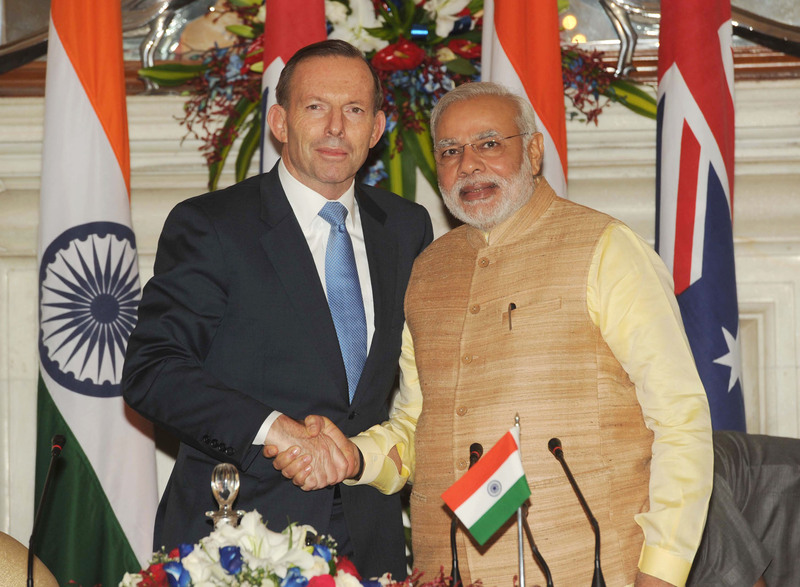 It was at 8.30 PM when Prime Minister Modi and his counterpart from Australia faced the media for a joint statement. Many agreements were signed including the civil nuclear cooperation agreement between the two countries which will lead to the export of Australian Uranium to India. Australia has about a third of the world’s Uranium and exports nearly 7,000 tonnes of it a year. India and Australia had started talks on Uranium sales in 2012 after former Labor Prime Minister Julia Gillard lifted a long-time ban on exporting it to India. Modi read his statement in Hindi with a few English words. His outfit and facial expressions were different this time. Two hours back he was almost on every Indian News channel speaking to school children on Teacher’s Day. He was in a light mood. But now he looked a changed person. Prime Minister Abbott was in good mood. With a soft and gentle smile he expressed his feelings. He had no written text with him. While speaking to the media he held the Indian Prime Minister’s hand warmly and said, “Trade is the key for friendship and prosperity.” That was the moment when more than 100 cameras clicked the picture of the day. There was a row of Australian delegation on the left side of the podium dressed in formal suits and outfits. The Indian delegation was generally in ‘bandgala’ suits and saris. 2. MOU on cooperation in Sports. 4. MOU on Cooperation in Technical and Vocational Education and Training (TVET). 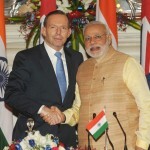 Prime Minister Tony Abbott renewed his invitation to Prime Minister Mr. Narendra Modi to visit Australia during the G 20 Summit in Brisbane in November 2014 This was accepted by Prime Minister Modi. Both sides agreed that the visit of Prime Minister Modi to Australia will lead to strengthening of the cooperative relations between the two countries, and will provide further impetus for the future development of the strategic partnership. (READ DETAILED STORY IN SAT September, 2014 hard copy issue).